In classrooms where LED lights were installed, teachers controlled a range of light settings, achieving more than 58 percent energy savings. 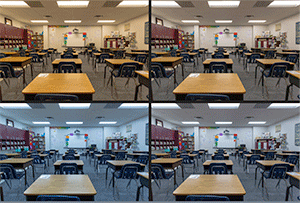 School districts are always looking for ways to stretch their budgets—and that includes classroom lighting. Through the Department of Energy’s GATEWAY program, researchers at PNNL recently evaluated the performance of light-emitting diode (LED) lighting systems in three classrooms in Carrollton, Texas, just north of Dallas. The new lights were used in the 2016-2017 school year. The LED lighting systems were installed in a fifth-grade math and science classroom at an elementary school, a fourth-grade reading and language arts classroom at another elementary school, and an eighth-grade science laboratory at a middle school. Each recessed fluorescent light fixture was replaced with an LED fixture from Acuity Brands Lighting. The LED lighting systems were white tunable, meaning teachers could change how warm or cool the lighting looked. They did this by choosing among four pre-set conditions on a control panel: general (the default setting), reading, testing, and energy. Teachers could also dim the lights or turn some off, for example when they wanted less light for audiovisual presentations or other activities. Students seemed to recognize the behavior cues that the control settings indicated. For example, the dimmed, warm setting became a cue for the students to be in their seats and quiet down. At the end of the school year, PNNL’s evaluation showed at least 58 percent energy savings overall for the LED lighting systems compared with the fluorescents. These savings came from the greater efficiency of LED lights. The ability to dim the lights increases the savings beyond 58%. Teachers told the PNNL researchers that they appreciated the ability to set the lighting exactly as they wanted it throughout the day. One teacher said that asking the students to change the settings increased their engagement. Students also seemed to recognize the behavior cues that the control settings indicated. For example, the dimmed, warm setting became a cue for the students to be in their seats and quiet down. An interesting finding was that the teachers tended to interpret the settings—reading, testing, and energy—too narrowly. They tended not to use the settings for classroom functions other than those specified on the labels. This finding could be important when designing future control settings. Location of the lighting controls also made a difference. Though the control panels were limited by existing wiring locations, teachers changed the settings more regularly when they were more easily accessible. 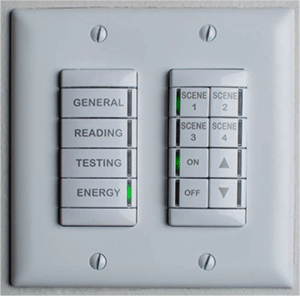 This could be important for school districts that consider installing new lighting controls in existing classrooms or when designing new buildings. GATEWAY evaluations, supported by DOE’s Solid State Lighting (SSL) program, evaluate high-performance LED products in commercial, municipal, and residential applications. The results provide valuable independent information on product performance and cost effectiveness for lighting manufacturers and other professionals. Previous GATEWAY studies evaluated energy savings from tunable LEDs in a hospital and a senior care center. The current study was the first in a classroom, and the first with occupants who are there only part of the day. The research is funded by DOE’s Office of Energy Efficiency & Renewable Energy. For more information, read the report on DOE’s website.